For six days, many of Don Ennis' 1,236 Facebook friends were a little confused. The ABC News producer started a countdown on his profile, hinting at a big change to come, posting videos of Sam Cooke singing "A Change Is Gonna Come," and Aretha Franklin and Luther Vandross covering Sam Cooke's "A Change Is Gonna Come." "You better not be planning to kill yourself, Ennis!" commented one friend. When May 3 arrived, Don Ennis was gone. Dawn Ennis had taken his place. 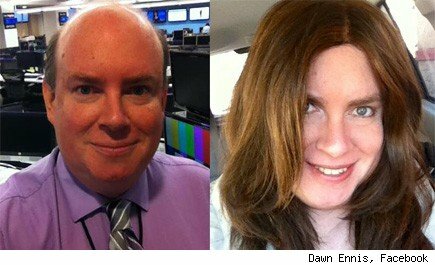 Don changed his name to Dawn on Facebook, posted a photo of himself in a long brunette wig, along with the quote, "To thine own self be true." That same day, the 49-year-old father of three marched into his office at ABC News in a "little black dress," the New York Post reported, and announced her new identity to co-workers. The next day at her home, Ennis moved out, leaving a wife. For the nearly 700,000 transgender individuals in the U.S. (according to the Williams Institute at the UCLA School of Law), the decision of if and how to come out at work can be extremely challenging. According to a 2009 study by the National Center for Transgender Equality and the National Gay and Lesbian Taskforce, 97 percent of transgender individuals have been harassed at work, and 47 percent said that they had been denied a job or a promotion, or been fired, because of their gender identity. Even though ABC, like most media companies, has inclusive policies when it comes to sexuality and gender identity, Ennis was worried too. A year ago, Ennis posted a comment on the YouTube video of another transwoman, saying that she worried about identifying as a woman at work because she was only part-time, and could easily lose her job. "I just got passed over -- again -- for a staff job," Ennis wrote. "... as an at/will employee all they have to do is drop hours or take my name off the schedule altogether [sic]. And so I wait." Ennis didn't have to wait long; according to her LinkedIn profile, Ennis landed a staff job as national desk assignment editor at ABC News just a couple months later. But Ennis' coming out also shows that coming out online can be just as important as coming out at work. In fact, our online and offline selves are so scrambled now, it would be almost impossible to be a woman in one realm and a man in the other. While coming out on social media is in some ways more stressful -- you're blasting your new gender identity to everyone from old classmates to Aunt Sue -- it can be a lot simpler too. Forget hormone therapies or surgery, you can transition genders with a new photo and a name edit. And if you're Ennis, you can tease your coming out like a new Justin Timberlake album. Another benefit of social media are the hundreds of friends and acquaintances right there, who can declare their support with a click. Ennis' announcement received dozens of "like"s, along with cheers of "beautiful!" and "AMEN, SISTER!!!" But Ennis' co-workers were plenty supportive in real life too. Some left flowers on her desk, the Post reported, and ABC News President Ben Sherwood even wrote her a personal note. "I'm overwhelmed by the strong support I've received from my co-workers," Ennis said in a statement, "and I'm looking forward to telling my story when I'm ready."